As a die hard Christma-holic, trust me when I say this: Munich Christmas markets are some next-level magic. You can stalk me on Instagram for proof – I’m practically living at the markets this month. (Here’s a Highlight w/ my 2018 Christmas Market explorations). Let’s put it this way, I love the holidays so much, I was probably made of gingerbread in a past life. And as someone who lives and breathes Christmas, I couldn’t have picked a better city to call home. Munich at Christmas time means cozying up with mulled wine (glühwein), eating one’s weight in candied almonds and soaking up a delightful ambiance that could melt even the Grinch. And sure, it may be the gallons of glühwein talking, but the Munich Christmas market scene is a true force to reckoned with, with countless options all over the city. This (ridiculously) thorough guide will walk you through the wildly magical world of Munich Christmas Markets, from the beautifully traditional to the more offbeat and unknown. I hope you like it! The Munich Christmas Market scene is filled with a mega-diverse roster of markets to visit, from the classic and traditional to the quirky and unconventional. This list covers some of the best, biggest and most interesting. Note that smaller ones do pop up around town as well, so check out the official Munich tourism website to get the full list. Pssst, don’t forget to pay attention to the Munich Christmas Market dates listed below – most of them will be closed by actual Christmas day, at which point all Bavarians kind of just hide in their homes and the streets are totally empty. You have been warned! THE king of Munich Christmas Markets. 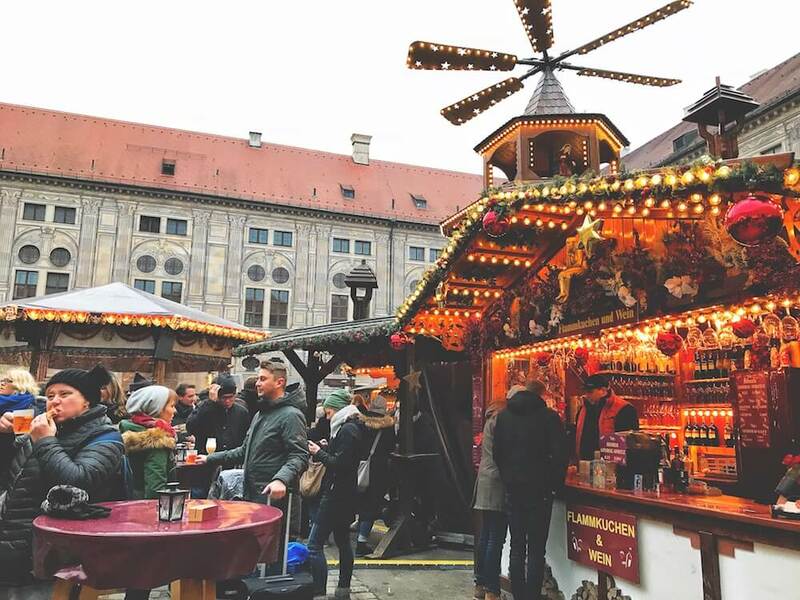 This Christkindlmarkt can be found in Marienplatz, Munich’s main square, with delightful stalls spilling out into the nearby shopping streets as well. Because of its central location in Munich’s Old Town, this is by far the most touristy and crowded market, but it’s popular for a reason: stall after stall of traditional handmade crafts, delightful snacks to be bought and the all-too-romantic backdrop of the Neues Rathaus. Be sure to duck into the courtyard of the Rathaus to see more stalls and the Christkindl post office, where you can get a special Christkindl stamp for your postcards/letters. PS: To get an extra magical view, be sure to climb up St Peter’s Church Tower after sunset too! As far as magic goes, it’s a little tough to beat a mini-Christmas village placed in the courtyard of a royal palace. This small market has a cozy assortment of different vendors selling traditional craft items, ornaments, snacks, and oh um, how can I forget – there’s a bunch of little doll displays that border on terrifying. STILL, that doesn’t take away from the market’s magical vibes. Do note that this one gets really packed and busy, so claustrophobes beware. You can view their full program of events here. 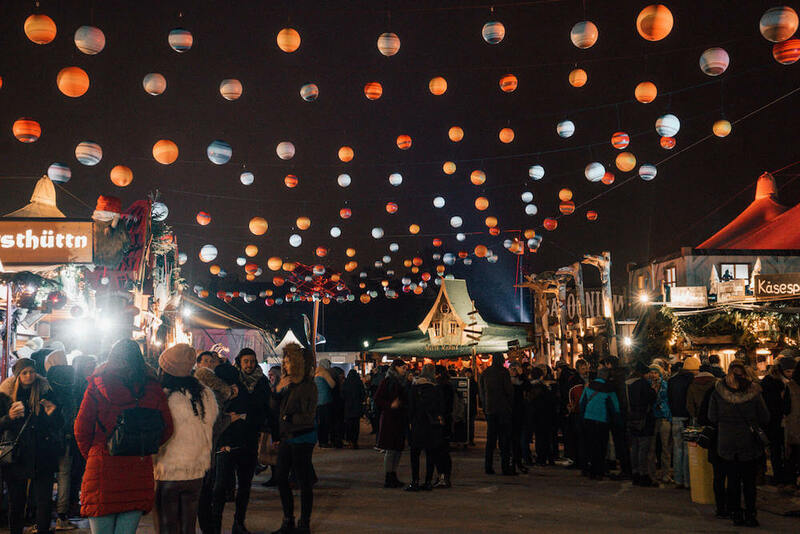 Munich’s famous open air food market gets a Christmassy makeover during the holidays, with the addition of multiple new stalls and some seriously pretty decorations. This year, they’re even introducing curling to the mix, if you fancy getting destroyed by skilled Bavarians 😉 Those in search of foodie gifts should definitely stop by here – you’ll be spoiled for choice with all of the delicious, local products. 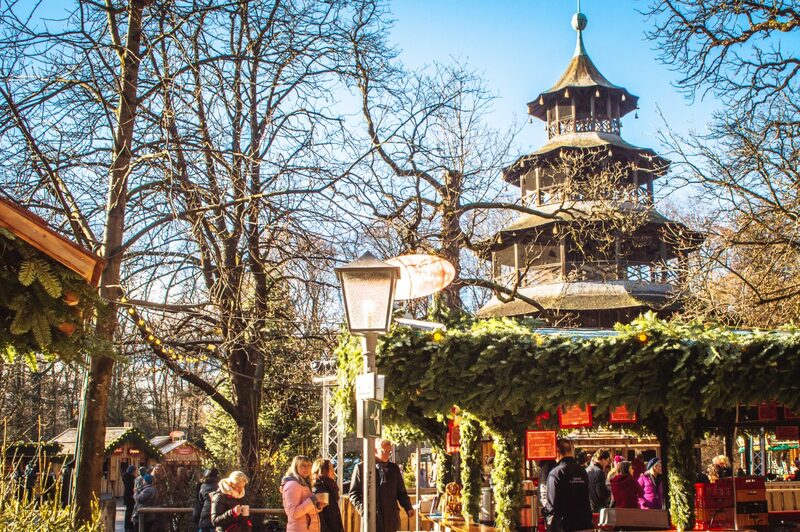 This enchanting little Christmas market can be found in the heart of Munich’s English Garden (one of the world’s largest city parks). The stalls are similar to what you would find at other markets (handmade jewelry, ornaments, crafts, etc.) but the ambiance is really something else. Secluded, quiet and painfully romantic – it’s perfect for a little date night. They even offer horse-drawn carriage rides on weekends so if you’re looking to ball out a little – here’s your chance. BONUS ROMANCE TIP: Venture onwards through the English Garden towards the Universitat U-Bahn station and you’ll find a little self-serve/takeaway kiosk selling snacks and gluwein (I’ll mark it on the map below). They have these really cute cable car pods that you can sit in while you enjoy your endless stream of festive drinks. Definitely worth a visit! Looking for a live tour of Germany’s best Christmas Markets? Stalk me on Instagram this month – it’ll be an explosion of Christmas magic. Watch this Highlight to see 2018 clips from Munich, Düsseldorf, Essen & more. Held at one of Munich’s few remaining city gates, this market is a smaller one with a really cool and buzzing vibe, especially in the evenings. 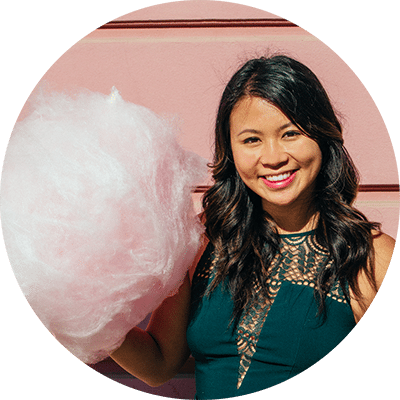 This is an awesome place to shop for gifts because they have a wide range of vendors selling cool products from around the world (so more than just the typical crafts and stalls you would see at most traditional markets). As a bonus, the neighbourhood around the market has a lot of cool bars and restaurants too, so it makes for the perfect evening out. 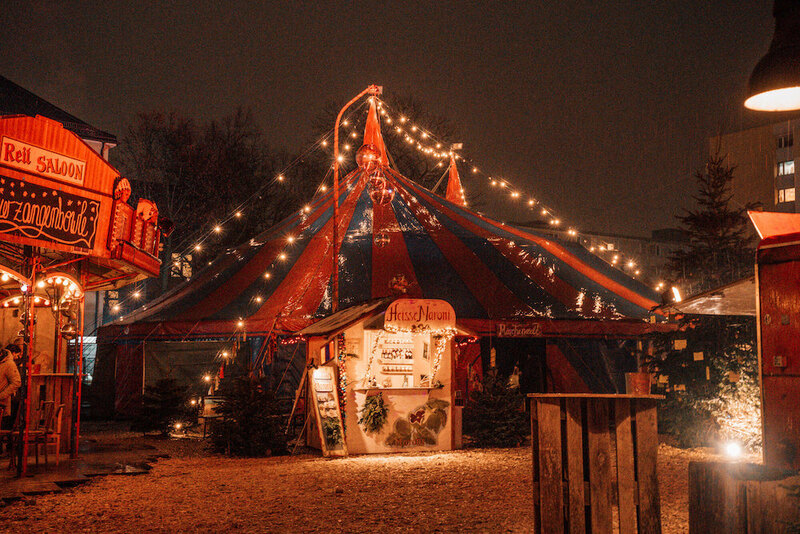 If you’re looking for a cozy and romantic Christmas market with a very local vibe, this is it! Despite being a small market, they have a wide selection of stalls to choose from this year, from traditional ones like wooden handicrafts and felt hats to geeky pop culture posters and memorabilia. 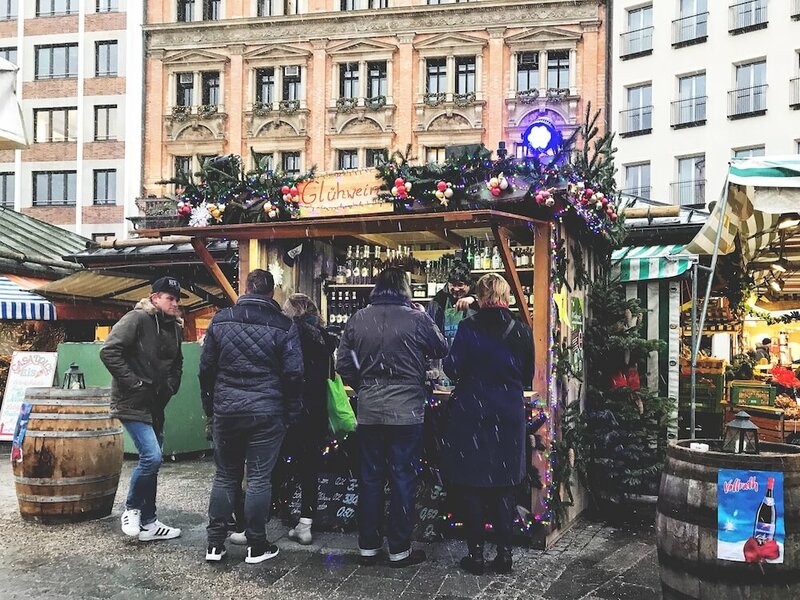 Keep an eye out for the mini Santa Claus on a bicycle who pedals on a wire above the market – he’ll lead you to a tasty refreshment stand where you’ll find a variety of special glühwein flavours like raspberry and cherry. PS: The way the lights are draped over the trees and the Glaspalast fountain in Weissenburger Platz = beyond dreamy. 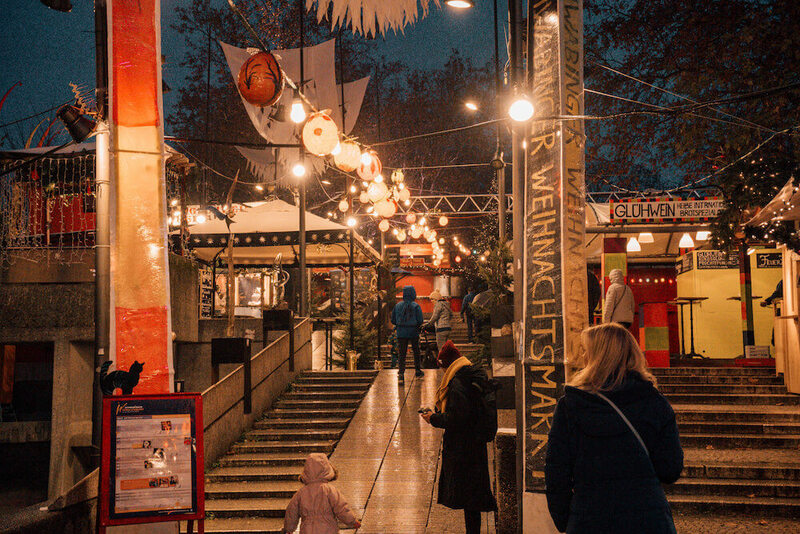 Held on the grounds of the world famous Oktoberfest, this massive alternative festival/market is comprised of a variety of tents, food stalls and shopping opportunities… but trust me, this is unlike any traditional Christmas market you’ve seen. Here’s the best way I can explain it: Tollwood is like that free spirit cousin of yours that went to art school, got into interpretive dance, loves to shop for fair trade, unique, handmade goods, and fills your feed with their worldly exploits. There’s definitely more of a party vibe here, with the festivities extending to 1am every night, and a massive array of events, performances, art installations and international cuisine options. It’s not a Christmas cliche by any means, but it’s a very cool place to put on your list. PS: Every year, Tollwood’s decor and festivities reflect a new theme (usually connected to advocacy in some way). 2018’s theme is “Good does better”, with a focus on everyday heroes and people doing… well, good! Out of all Munich Christmas markets, this one might just be my favourite. 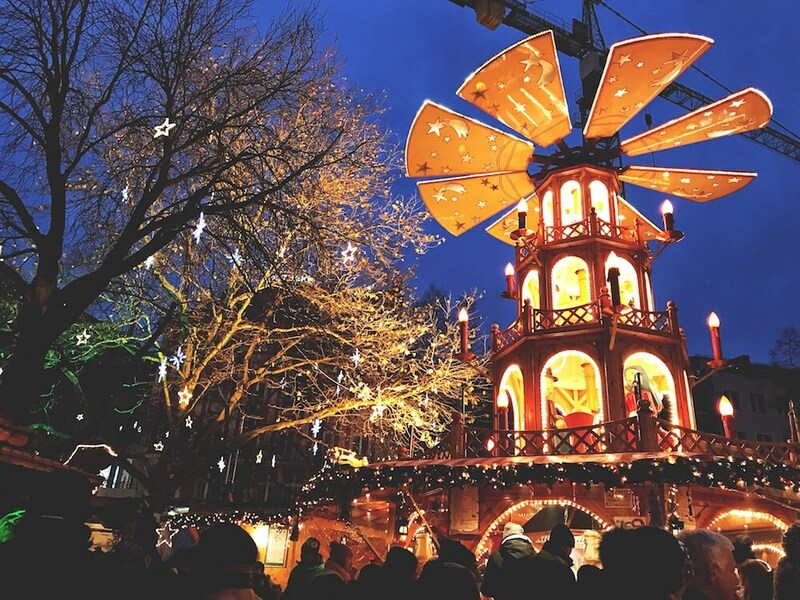 Take a step back in time at this Medieval-themed Christmas Market at Wittelsbacher Platz, just a short walk away from Munich’s famous Odeonsplatz. Here, you can drink firey rum out of clay goblets, shop for authentic drinking horns and stock up on delightful handmade craft items. If you’re lucky, you might even catch entertainment from costumed jugglers and minstrels, who delight the crowds on weekends. Now, if you need to find me, I’ll be that girl lurking around the knights in shining armour. This artsy and grungy twist on the traditional Christmas market is one of my favourites in Munich! Featuring a mashup of all sorts of wonderful things – from delicious international foods like vegan doner and crepes to a wide assortment of creative handmade goods, there’s a little something for everyone. Imagine a psychadelic and gritty fairground with a circus-like aesthetic, and that’s the Märchenbazar. Beautiful twinkle lights, colourful street art and even a Weißwurst breakfast on weekends from 11am onwards… what more could you want? Unlike most markets, this one is special because it’s actually open on Christmas, and is where I went for Christmas day 2 years ago with a group of my Exchange friends! RANDOM 2018 TIP: The butter chicken here is FANTASTIC. You’ll find a little stall selling it inside one of the market tents. Kitschy, pink and 50 shades of wonderful, this is definitely not your traditional Munich Christmas Market… Think less star lamps and Christmas carols and moooore cocktails and drag queens. 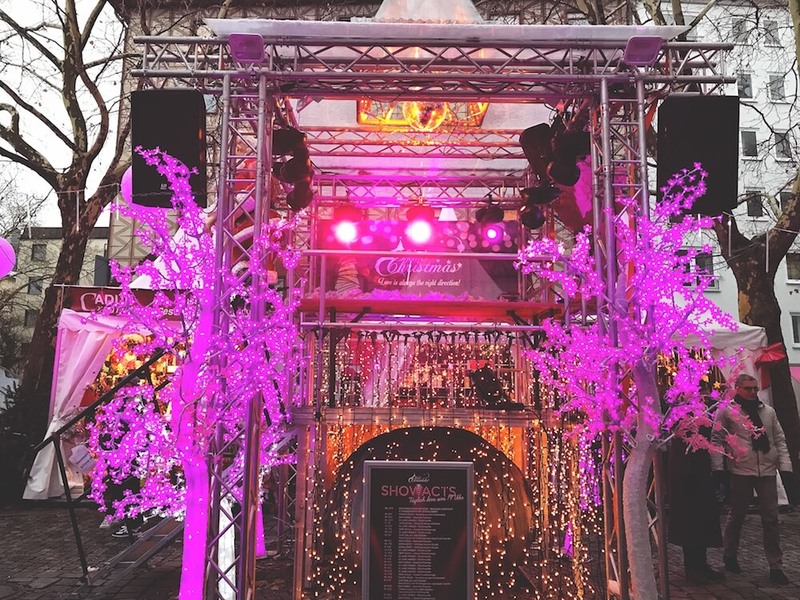 ‘Pink Christmas’ is a friendly and inclusive market found in Glockenbachviertel, Munich’s LGBTQ neighbourhood, decked out with plenty of pink lights and a bumpin’ stage with all sorts of great performances. Everyone is welcome here, which results in a highly contagious enthusiasm. Definitely come here in the evening, when the bright pink glow can be seen from even far away. 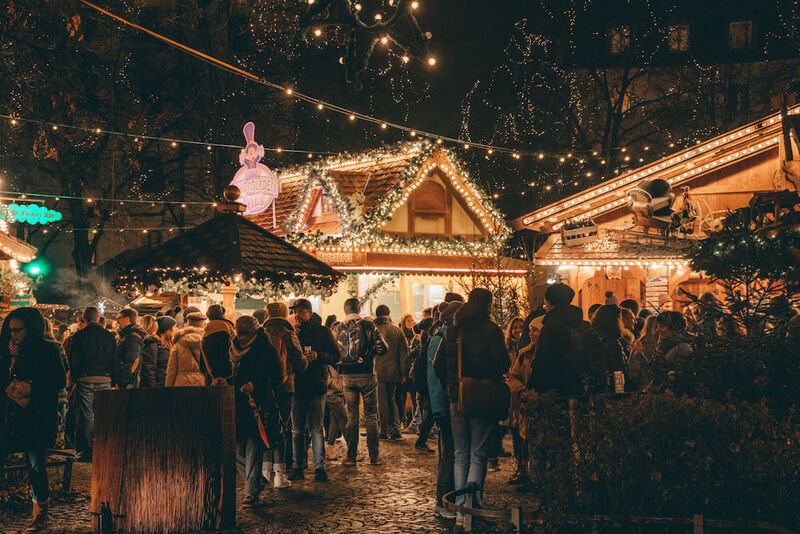 Located right by the Münchner Freiheit UBahn station, the Schwabing Christmas market puts a bohemian twist on Munich’s yuletide festivities, offering up a treasure trove of amazing artisan vendors, crafts, art installations and performances. There’s definitely more of a local vibe here than some of the more traditional markets. Well worth a visit – especially for the art tent. 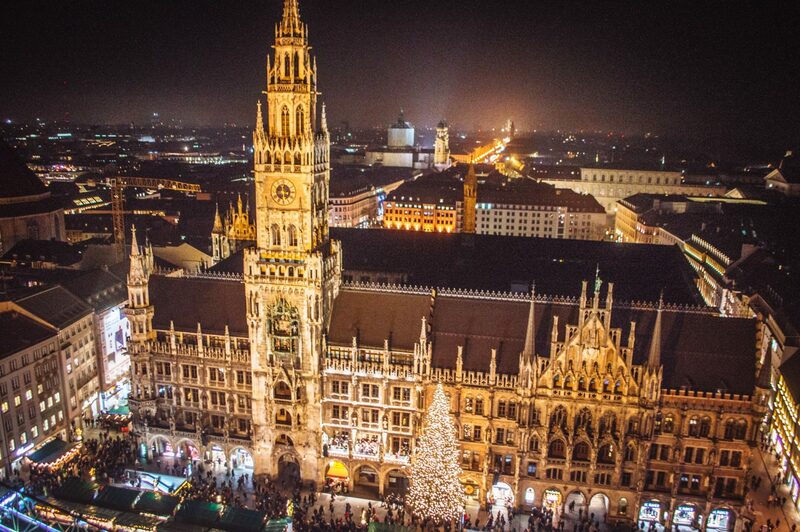 If you’re arriving by plane, here’s a fun fact: you can already get your fill of Christmas markets in Munich…. right at the airport. 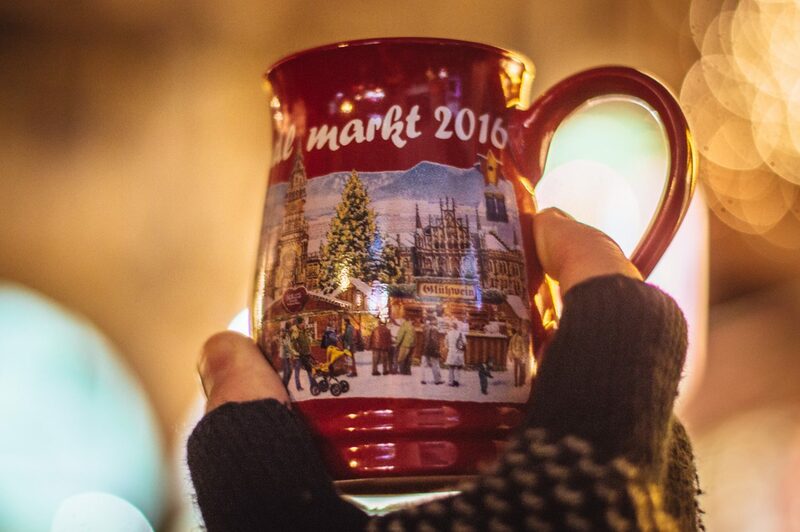 That’s right – fresh off the plane and you’re already immersed in Xmas Market Magic. I remember the first time I came across it, when I landed at MUC last December after a dreary 3 months living away from the city. It was like getting punched in the face with Christmas spirit and that special brand of magic that Munich does best. This market has been going on for almost 20 years, and yes, it’s simply magical. NOTE: I wouldn’t plan on doing too much shopping at these stalls. From what I noticed, many sold mass produced goods that were on the cheap side (10-15 euro scarves for example). The market is really beautiful but you can definitely get higher quality gifts elsewhere in Munich! 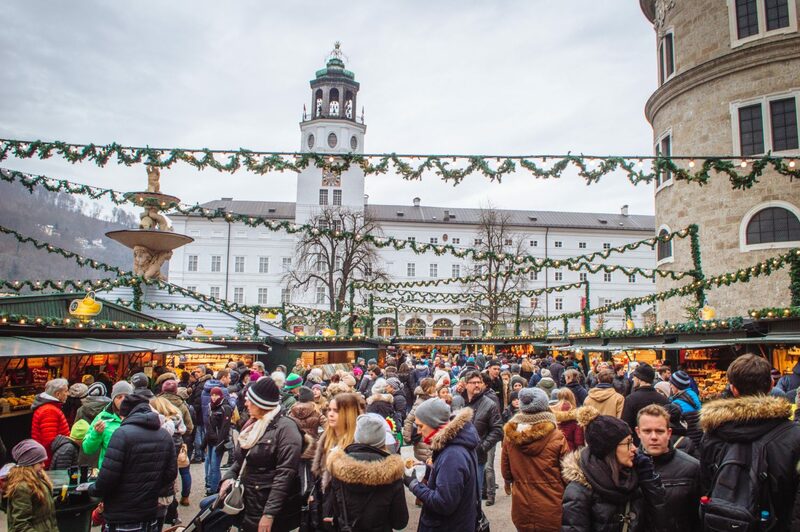 PS: The Dachau Christmas Market is home to Bavaria’s largest advent calendar! Salzburg, Austria is only an hour’s train ride away from Munich and is home to its own droolworthy set of Christmas markets. My favourite is the Salzburger Christkindlmarkt, right in front of the city’s main cathedral. 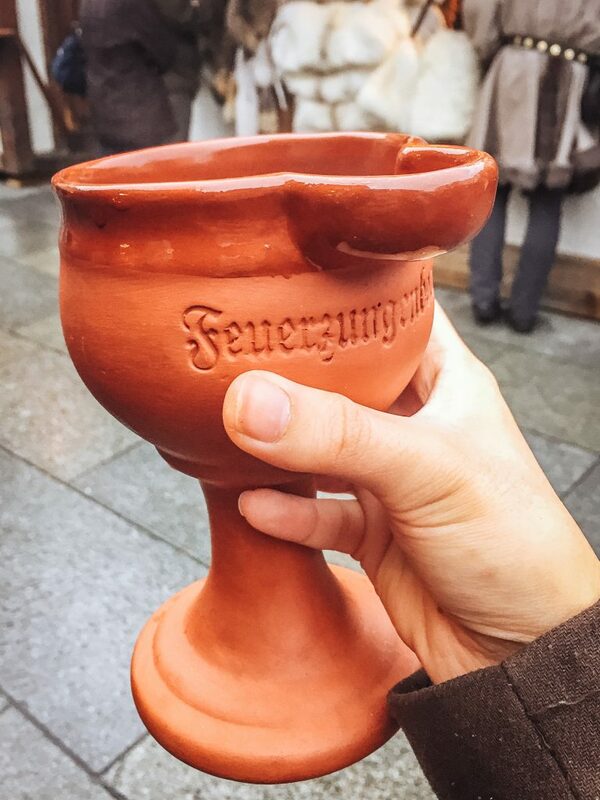 One of the best parts of visiting a Munich Christmas market is duh – all the delicious food and drink! If your head is already spinning from the sweet smells of cinnamon, grilled bratwurst and roasted chestnuts, here’s a guide on what you absolutely must eat and drink. If you want a FULL list with 30+ treats, you can find it here. Glühwein: Pronounced ‘glue-vine’. AKA mulled wine. AKA heaven in a cup. Hot wine flavoured with delicious spices – there’s no better way to warm up.! NOTE: You’ll usually be required to pay 1-2 euros as a “Pfand (deposit)” for these cute little glasses, so be prepared to pay more than what the signs say, especially if you intend to keep them as souvenirs. Last but not least, I have to say: be sure to experiment with different flavours too – the ones made with white wine are AMAZING. Feuerzangenbowle: Pretty much glühwein on steroids. In this drink, your glühwein is topped with a sugar cube soaked in rum, then LIT ON FIRE. It’s strong, it’s amazing, and it’s pretty much the best part of Christmas. Eierpunsch: Booze-tastic egg based drink similar to eggnog. A must try if your stomach isn’t already full from all the glühwein. Kinderpunsch: A hot drink made with a variety of juices and spices to get that nice warm, tingly feel without the alcohol. Perfect for kids and non-drinkers! Gebrannte Mandeln (Roasted almonds): I think I once described these to a friend as “Christmas crack”. That’s how good they are. You’ll smell them from a mile away and they are the yummiest snack to have in hand while browsing all the stalls. Get it – you won’t regret it… but your waistline might. Wurst (sausages): I mean, you’re in Germany, soooo… The smell of wurst will lure you in from the get go, with all sorts of options to tempt even the strongest willed. Comically large bratwursts are a common sight, but I have a soft spot for the little Nürnberger Rostbratwursts, which are served in groups of 3, usually with a bun. So good! Käsespätzle: Cheesy dumplings topped with crispy fried onions – a Bavarian classic and oh so comforting. Think of it like mac and cheese but infinitely better. Rohrnudel: A sweet fluffy dumpling smothered in vanilla sauce. Sometimes with a fruity jam filling. Are you still breathing? I’m not. Lebkucken: Gingerbread-esque cookies topped with icing! Often prettier to look at than they taste, but with how good they look, it’s tough to resist. Apfelkücherl: Spiced apple rings coated in batter then deep fried to perfection. Like apple donuts! … and much, much more. Just follow your nose! PS: If you’re still hungry, check out my Munich restaurants guide for visitors. Munich Christmas markets are packed with vendors and stalls selling beautiful, quality goods. For your inspiration, here are a few of the classic gifts that you can purchase, but you can find a full shopping guide here. Ornaments: From hand-painted baubles to intricately carved wood pieces, there’s no better place than a Munich Christmas market to grab special, handcrafted ornaments! Many of the stalls will even have demos of them being made, so you can watch the talented creators at werk werk werk. Paper lantern Christmas stars: These are the prettiest things ever, and I would honestly cover my house with them if I could. I’m not sure of their official name, but you’ll see them everywhere, sold as decorative lamps and even tree toppers. Handmade candles and candle holders: Maybe I’m just attracted by pretty lights (and shiny objects, duh) but one of my favourite gifts to buy at Munich Christmas markets are candles and specialized holders. There’s gorgeous wooden ones that look like tree trunks, some (kinda corny but still cute) holders with spinning metal charms in different shapes. Definitely an easy gift to bring home! … and again: so much more! Especially if you visit some of the more alternative markets, there are all sorts of incredible souvenirs and gifts to choose from. Word of warning: your wallet might struggle a bit. Wondering how to hit up as many Munich Christmas Markets as you can in one day? Or which ones to do together? Here’s a handy map for you, with all the markets listed above. If you need help navigating Munich’s public transportation by the way, I have a full guide on that here. Have any more questions about Munich Xmas markets, ask away in the comments! If you liked this guide on the best Munich Christmas Markets, why not hover on the upper left hand corner of the fancy graphics below and save the inspo for later? 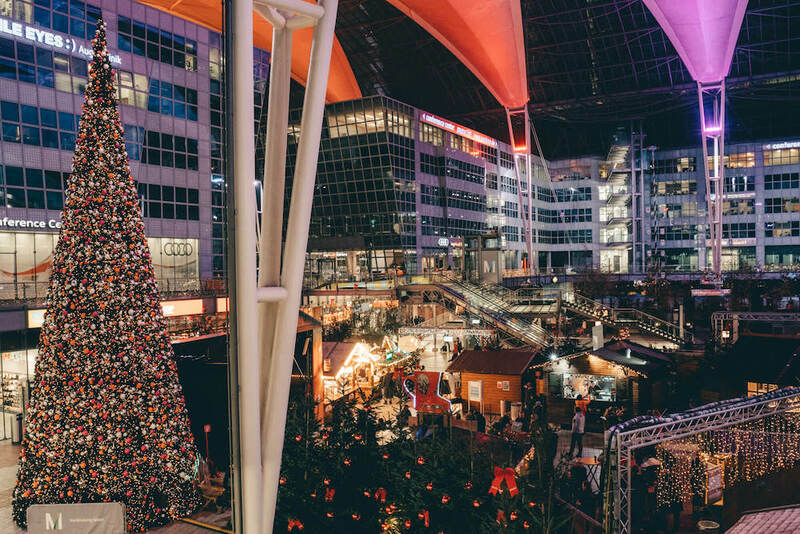 Next ArticleFrankfurt Christmas Market Guide: Where to Go, What to Eat & More! It’s seriously one of the best places to celebrate the holidays. Come find out for yourself! they are AMAZING. Definitely put them on your list! Awesome guide! I love Christmas Markets SO much and really enjoyed the ones in Munich. The one at Schwabing was near where we were staying during our visit, so we went there quite a lot – luckily we loved it! Can’t wait for the season to begin! Munich absolutely kills it at Christmas. So lucky I live here! Thanks for reading and I hope you have an amazing holiday season filled with many mulled wines haha. 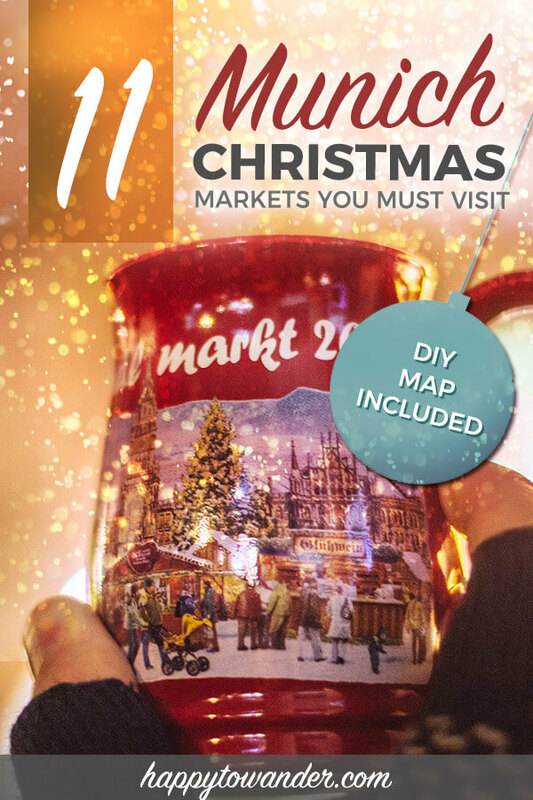 Great guide of the Christmas Markets! makes me want to go back this year! I didn’t realize that one city had so many. This is big on my wish list and I think next year I’m going to dedicate all of December to Christmas market-ing it up! Will save this for that time! Yes Munich is Christmas central and I LOVE IT. Hope you get to explore a bunch of amazing markets this month! We will be in Munich over Christmas Eve. Thank you for the guide. We will not arrive until the morning of Dec 24. Do you have any idea of which restaurants may be open on the evening of Dec 24. Thank you. Hi Debbie, sorry I missed this comment! As you probably know, most restaurants will be closed on Dec 24 as that’s the main celebration day here. Your best bet will be the (more touristy) restaurants in the city center. I know for sure Hofbrauhaus is open 365 days a year, so I would try them first (maybe make a reservation if possible to be safe). Otherwise I’ve heard Ratskeller (right in the city center) is open as well. Hope that helps! Perfect timing! I’m going to Munich/Salzburg this December for the Christmas markets. I’m also heading to Nuremberg, Rothenburg obT and Bamberg. My hope was to experience different kinds of markets and with that, varied crafts/ornaments. I’ve heard such great things. Thank you for such a detailed list! Shannon, that sounds like such a dream trip!! I hope this article comes in handy for your planning. Have an amazing time! Fantastic post!!!!! Soooo helpful. We have been Christmas market hopping in Germany for almost two weeks now and have been everywhere. We started here in Munich and are ending here! I really wish I would’ve stumbled upon this the day we started!! Still an awesome guide so we know what other markets here in Munich to check out today and tomorrow! Thank you!!!! Hey Christina! Very helpful article! We’re coming from India.. it’s our first time to Munich and we’ll be in town only from Dec 26th morn to 30th morn. Any list of where to buy those wooden souvenirs and sheepskin products from? 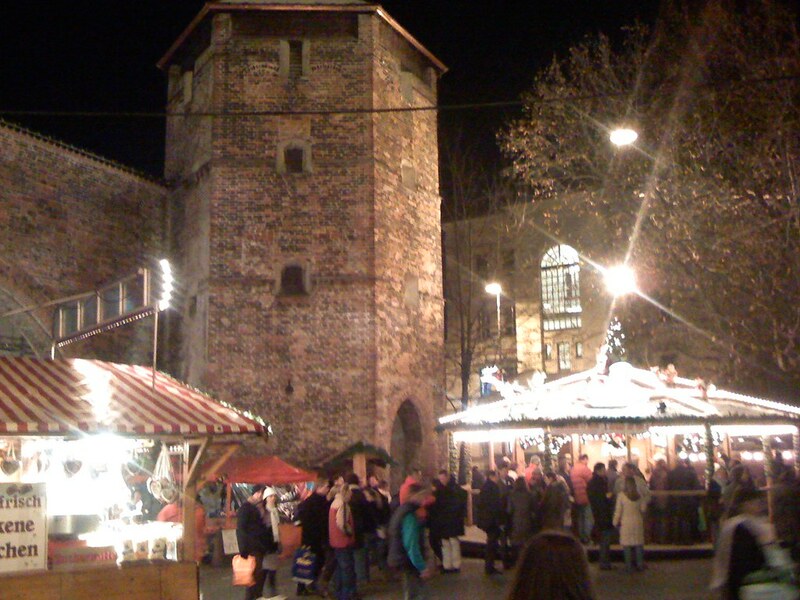 So sad I’ll miss these lovely Xmas markets :(( Best places to make up for such an ambience? Hi Nabeela, it’s such a shame that you’ll be missing the markets! The good news is, the Tollwood Winter Festival mentioned in this post is open until New Years, so you can go and enjoy at least one festival 🙂 I think their marketplace closes before Christmas though, so I’m not sure if you’ll be able to buy your souvenirs there. That said, there are a lot of shops in the city center (Old Town area) that sell Bavarian souvenirs, and while many of them won’t be the same handcrafted/artisan quality that you would get from Xmas market stalls, you will often find typical Bavarian goods there to bring home. Hope that helps! Yay, Lianne! So happy to hear that <3 Hope you had an amazing time in Munich! Great article! Thank you for all the information!! Looks like the Winter Magic at Viktualienmarkt (Winterzauber auf dem Viktualienmarkt) will be the only one still open for our dates. Is this one as “Christmassy” as the others since it’s a year round market? Another question I had was is there currently snow on the ground in Munich? I’m trying to plan clothing and shoes for our family. We will be there soon! So excited for the markets. Thank you for all the tips and help! Awesome article! We are arriving in Munich December 24 2018….sad we are going to miss just about all the markets if the 2018 dates follow the 2017 ones. We are wondering if the city will still be Christmasy. And we’ll be looking for a nice Christmas dinner Please post your thoughts and suggestions. Your recap of 2017’s markets was helpful and hilarious! This was so, SO helpful! My husband and I are traveling to Germany (&Austria & Croatia) for the first time for Christmas markets this December! Thank you!! I’ve been looking up article after article about the Munich Christmas markets, and this was by far the MOST helpful. Thank you; I’m so excited for our trip! Wonderful article! Thank you for all the information. Do you recommend staying at a certain hotel? Possibly close to everything? Also, when is the best day to go? I know it is probably busy everyday but, is there a certain period where it isn’t so crowded? Thank you for sharing all this information. I am so excited to go! Hi luuuuv your article n we will be following a lot of it when we get there in december, were coming from australia for the first time. Do u attend the Krampas pde, is it good and whats best place to see it. You’re so welcome, Karina. Hope you have an amazing time in Munich!